TEACHERS CHRISTIAN FELLOWSHIP WORKSHOP 2010. 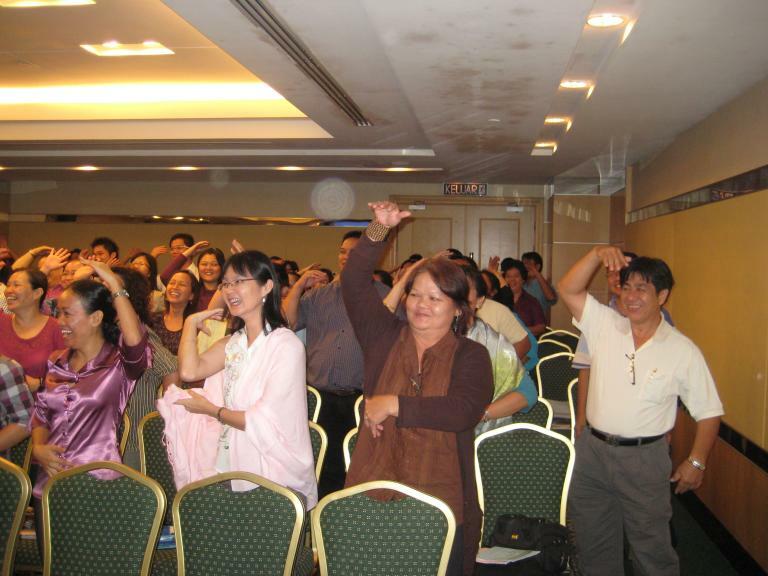 Teachers Christian Fellowship Malaysia is a registered Christian fellowship Body of Christian teachers in Malaysia. The main objective is to realize our calling and serve God in schools or colleges. THE MIRI TCF FELLOWSHIP DINNER WILL BE HELD ON THE 30.07.2016. 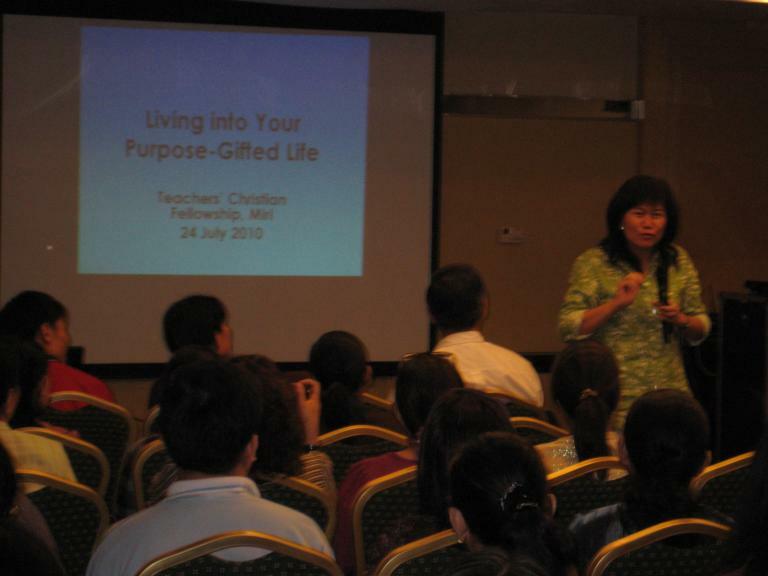 – More than 230 teachers and friends turned up for this year event which was held at Dynasty Hotel on the 5th of July. Indy tghe secreatary General of TCF Malaysia was present. Pastor Phua Seng Tiong, a former Pengetua Cemerlang graced the event with his excellent talk of the teacher’s special calling. – As usual, His Sparrows were there to entertain the teachers with gospel songs and dance. – Earlier on, Mr Phua visited ST Columbia who was organizing the Bible knowledge Quiz and then went to SMK Bakong to give talk to some 200 + boarding students. – Pastor Phua also spoke at two local churches on sunday. THE TCFM DINNER FELLOWSHIP ON THE 14JULY 2012. What a wonderful time we had during this fellowship dinner. About 300 teachers and friends attended it and it is heartening to know that more and more Christian teachers are acknowledging the importance of fellowshipping and to stay connected to the Master Teacher- Jesus Christ. The speaker Ms Seah spoke on the ABC of being a teacher and that of course is very insightful for everyone. About 19 headmasters and principals attended this fellowship with their teachers. Miss Indyrany confirmed that Miri TCF Fellowship had always been the grandiest in the country. Hats off to all the Christian teachers who always make a difference in the life of their students. Let us continue to contribute towards the betterment of our country. TEACHERS ARE VERY SPECIAL PEOPLE. They are always there to help students and no teacher would like their students to misbehave or to fail their examinations. But of course there are some who actually are not teachers at heart. Christian teachers are very responsible, very devoted and are very credible people. They know the truth and that is why they will perform their duty with passion and with care. JESUS is the master teacher. We have to put our hand in the hand of the Man who calmed the sea. For the past 6 years, Teachers Christian Fellowship Miri, had organized many activities for its members not only in Miri but around Miri as well. Most of its activities were fellowship dinner, Teachers Day Celebration, prayer meetings and Seminars and Workshops. During these activities, we are able to have fellowship with other Christian teachers from different schools. We are able to share and encourage one another. TCF Miri had host the TCF Sarawak Conferences as well as other important event such as ISCF HOMECOMING EVENT and ISCF Rally. Being part of Scripture Union Sarawak, TCF Miri had contributed a lot to its activities. TCF Miri had close relation with TCF Malaysia. Most of the speakers invited for our Seminars and Workshops are International Speakers of high calibre and renown in the educational circles. TCF Miri hopes to help train and improve the teaching skills of the teachers so that we become responsible and better teachers as our contribution of our teaching profession and our country. At the same time, we hope to help one another in our faith. An international Speaker from Singapore. a FORMER dIRECTOR GENERAL OF eDUCATION SiNGAPORE. Every teacher wants to be respected and loved by his or her students.When we were students before, we called teachers all kind of names.We gave them names because we disliked them.The teachers that we disfavour were those who comes into the class in bad mood and get angry at any opportunity;those who likes to boast; teachers who show favouritism, teachers who do not mark exercise books, teachers who pretend to teach, teachers who are lazy, teachers who comes late and leave the class early, teachers who do not want to help and those who have poor discipline themselves etc. Teachers who are firm but fair are respected too.Those who like to help students would surely gain their respect and love.Teachers who show concern about the students welfare and academic performance would be well-liked by the students. One of the good things that these teachers do is they sacrifice their time,effort and money for the betterment of their students.An little act of good deed will find a place in the heart of any student.Buying a pen for a needy student is a small act of concern and love but its effect on the student will be lasting. A good teacher begins the day with a smile and ends it also with a smile.When the teacher smiles, the learning process becomes smoother because the young minds and hearts are softer and ready to accept what is taught. There are many rules in school, but we must always know that there are many reasons why some students break the rules.The good teacher will try to understand his student more so that he will be able to help.Students come from different families or (institutions)so are the teachers.Therefore, we need to learn what kind of manners or behaviour are taught by the student’s parents- to be able to understand our student. I had punsihed many students, by canning, doing some work, suspension and fine but although some forms of punishment are effective these are not really the answer to curb indiscipline. Some simple acts of love and concern can help curb indiscipline in a person without resorting to creating fear techniques.We should punish but at the same time be quick to reach out to the student.Creating an atmosphere of respect and love will surely help a lot to avoid carrying out such punishment. Teachers are 24 hours busy, hence holidays are much waited for.Teachers should try to go somewhere to spend their holidays with their family or without their children if possible.Attending courses or seminars during holidays will not give us a break from the books or class situation. Knowing the parents of the students are very helpful.First, the students will try to behave for fear that we will speak to their parents.Secondly, we will be able to understand the student better by knowing their parents background. Speaking to the students on a personal basis is one way for us to encourage the student to communicate easily with us.Calling their names is even better. Joining a Chrsitian Fellowship is the wisest decision that we can make.First, we are able to share our burden with those who are like-minded.Secondly, we learn from the experiences of others.Thirdly, we have a close network of friends who will understand and will help us in times of need and most importantly, we are able to learn from the Master- the true teacher, JESUS CHIRST.Teachers are a well organized lot, because they have to be.With lots of students around them, proper organization is necessary.Joining TCF means we want to acknowledge that there is a Master teacher in whom we trust. 1.Teaching by example.To be a respected teacher, we need to be an example in almost everything, including our lifestyle and character.That was what Jesus did to His disciples.They were attracted to Him not only by what He was teaching but by the way He live with them.We cannot be respected and trusted if our way of life is not acceptable by the general public.To gain respect and trust, we must be seen as an honest, truthful person who has good moral values.We cannot be a leader or teacher if we have no moral values. Normally, a teacher can only be a good teacher if he or she is accepted by his or her students.Nowadays, it is very difficult to find a good teacher. In 1984, I received a letter from the Director informing me to report to a very remote school in the Kelabit Highlands, as a school principal.The secondary school is only accessible by MAS.At the age of 29, they asked me to assume the responsibility of a headmaster.I almost didn’t go. A former principal of the school told me that the place is like heaven!I eventually loved the place and when I was transfered to a new school 6 years later, everybody, especially the people there were very emotional.I was transfered there because of God’s plan. As a school principal, I received many young teachers who had all kinds of look/expressions when they first report for duty.Some were happy, but there were some who cried themselves to sleep the first few weeks.But later, they got over it and were able to stay there for a number of years. Of course they were some who reported for duty and then left immediately. Quite unfortunate. They were given the chance to enrich others’ lives and their own but they just couldn’t accept the challenges. As a person we need to mix around and learn the basic things such as washing our own clothes, cooking simple meals, learning to eat all kinds of wild vegetables etc.These are very useful if we are to be transfered away from the town.There were cases where some fresh university graduates don’t even know what is cloth hangers or how to wash their own clothes!What more cooking! The real fear of being posted to new school is not because of the students or teachers that they are going to meet, but because they had not acquired the simple basic skills of being independent and looking after oneself. For the Christian teacher, being posted to a new school is actually God’s plan. God places His people to help bring the good News.We always react negatively when we are posted to a place that we do not know.I was asked to go to my present school some 7 years ago. I never thought of being posted there anymore after I was posted to another place.But many years later, after serving in 3 different schools, I was moved to the school that I had refused to go and I couldn’t refused anymore. Now, being in this school, God’s plans are beginning to unfold.Being in my present school brings a lot of blessing to others as well as ourselves. Our lives are enriched as we enrich the lives of our students and fellow teachers. When we are posted to a new school, we should find out who are the Christian teachers in the school.From there, we will be able to start moving around. So if you are a new teacher, and being posted to some places not in your map, accept it. You will come out of it with beautiful memories and a very wise teacher. There were all lining up, at the door of the class room.They had made their classroom a guest room, with all kinds of food and soft drinks waiting for all the teachers who enter their classroom.It was teachers Day.With huge welcoming smiles they greeted us, giving us cards and flowers…happy teachers day!Teachers day in my school is the happiest moment for my teachers because it was the day, our students and teachers laugh,joke, talk and play together!What a wonderful moment to cherish.We have 19 classrooms and 19 guest rooms! If you are a teacher, you are a person who will shape the life of a child forever, for better or for worst.You are no ordinary person.The life of an individual is in your hands.He will succeed or fail in life because of you. The way he or she thinks depend on you.So you are no ordinary person.You are more than just a teacher.If you are a Christian, you responsibilities will be quite obvious.Someday, they will remember you.Hence, remember to be a good teacher.